Please join us on Nov. 13 for “Black Empowerment through Supporting Black Businesses” a free program hosted by Create Community 4 Decatur/ DeKalb: Black Lives Matter. Are you a black business owner who would like to get the word out about your business? Are you someone interested in finding out about black businesses or services that you can support? 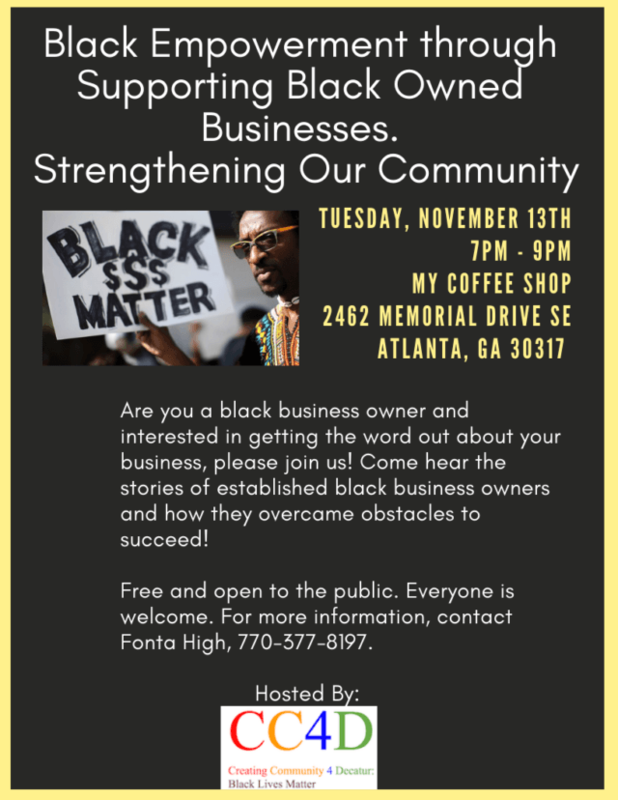 Come hear black business owners sharing stories about how they overcame obstacles to succeed. Location for Nov. 13 meeting: My Coffee Shop at Eastlake, 2462 Memorial Dr. SE, Atlanta, GA 30317. Free and open to the public. Everyone is welcome.